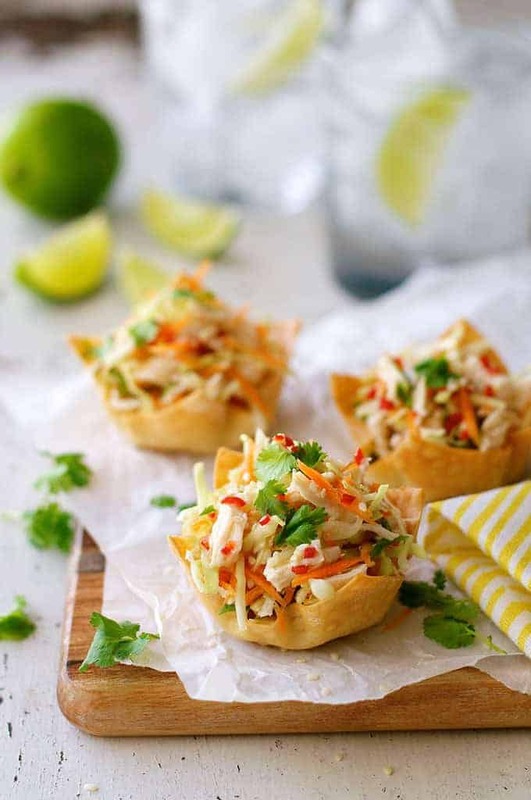 Thai Chicken Salad Wonton Cups are party food that travels well and can be prepared ahead! Wonton wrappers are my shortcut party food tip. They are the perfect size to mould into muffin tins to bake into cups, then you can fill them with whatever sweet or savoury filling takes your fancy. No cutting rounds out of pastry! They stay nice and crispy for around 3 days. Just let them cool then pop them into an airtight container, ready for your party. These ones I’m sharing today are filled with Thai Chicken Salad – an all round crowd pleaser, and something a little different to the usual creamy dips. It’s light and refreshing, but has a nice zingy dressing. I prepare the components ahead – the cups, salad and dressing. Then just before serving, toss the salad in the dressing and spoon into the cups. The salad isn’t soaked with excessive dressing so it doesn’t make the bottom of the cup soggy. To be honest, these don’t usually last that long when I put them out but when I was photographing them, I had them sitting around for about 1 hour and they were still fine. The base of the cups were a bit soft, but there is so much crunch from the sides that it didn’t bother me at all. Some more mini one-bite Appetizers! Quiche Toast Cups – mini quiche made with bread! 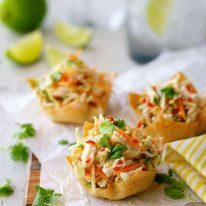 Wonton wrappers baked in a muffin tin to form cups, then filled with a refreshing Thai salad garnished with a little spice kick! Place wonton wrappers into a regular muffin tin, moulding it into the cups. Bake for 12 to 15 minutes, until crisp and light golden brown. Remove from the oven and let the cups cool in the muffin tin. Store in an airtight container until required (stays crisp for up to 3 days). Combine Dressing ingredients in a jar and shake to combine. 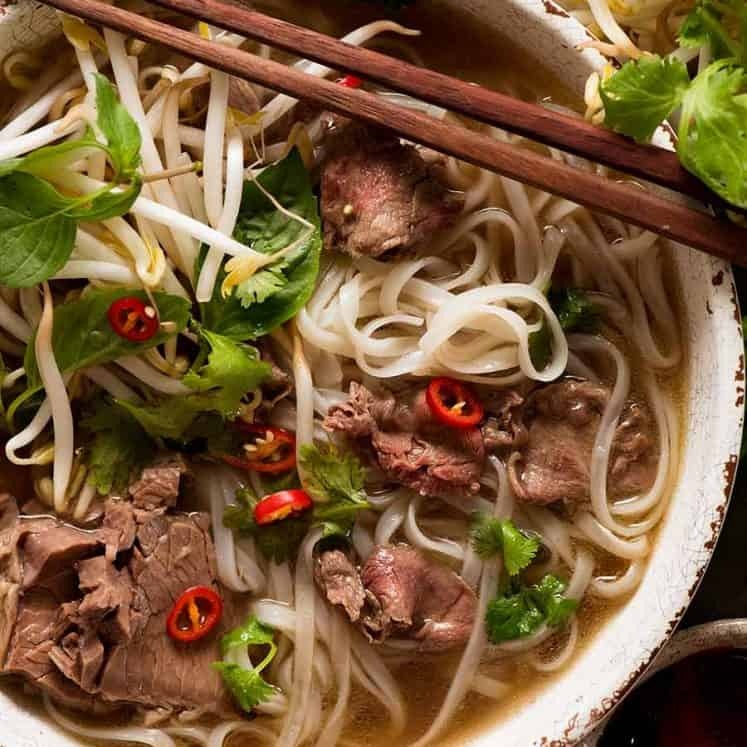 Set aside for at least 10 minutes to allow the flavours to infuse. Combine Chicken Salad ingredients in a bowl and toss to combine. To serve: Discard the garlic clove from the Dressing, then toss it through the Chicken Salad. Divide the Chicken Salad between the cups. Garnish with sesame seeds and cilantro/coriander, if using. Serve immediately. 1. Use the side of your knife to smash a garlic clove so it breaks open but remains in one piece. You don't even need to peel it. The garlic is used to infuse the dressing. 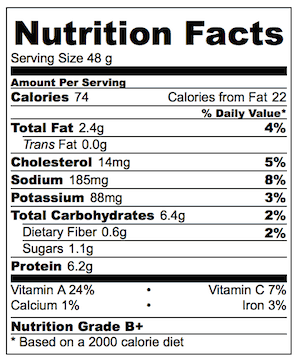 You could use minced garlic if you prefer but I find that the garlic flavour is too strong for my taste. 2. The cups are best assembled just prior to serving. Hi Faye! Did you email through the contact page on my website?? Thank you so much for the recipe I though this was very easy and tasty. The only thing I would suggest is maybe make extra sauce or dressing just to have on hand. 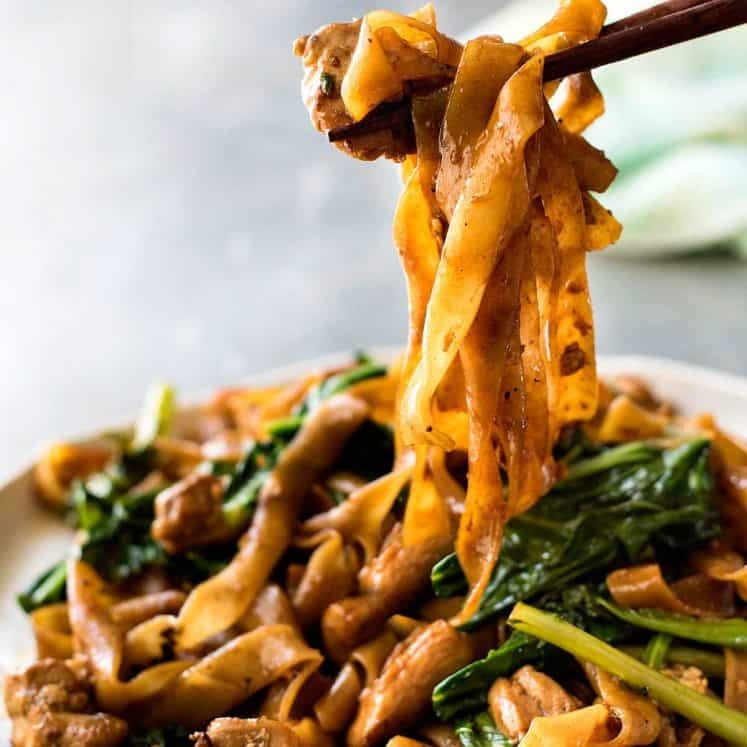 i have a huge pet peeve about people who leave reviews without trying a recipe, SO, in that spirit I tried this and it was unusual and fantastic. 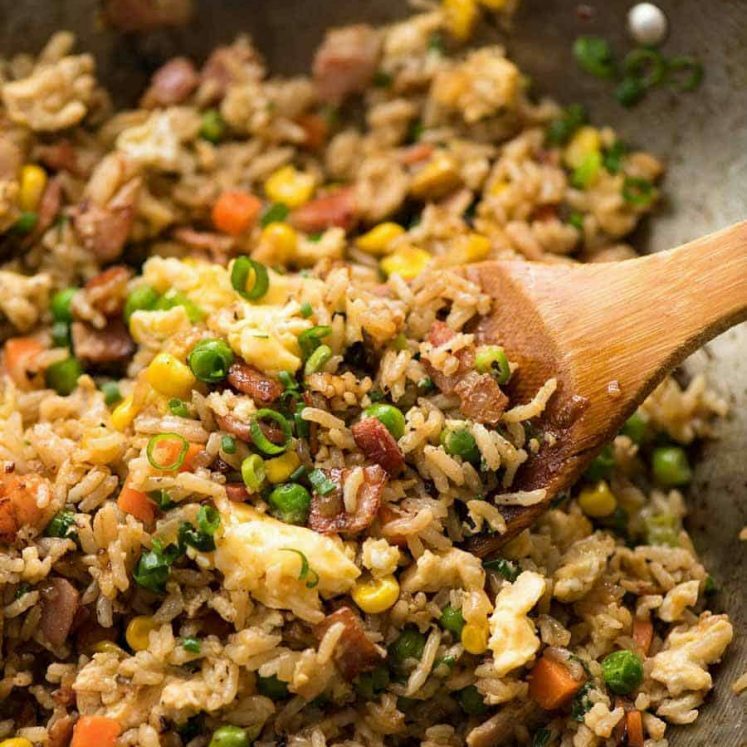 so easy and great for using up leftover rotisserie chicken. thanks! I always wanted to make wonton cups, but I’ll probably try sweet version first since I’m sugar addicted 🙂 As always great photos Nagi! Hi Nagi! This sure looks like an amazing appetizer! Plus, it sounds so incredibly easy! 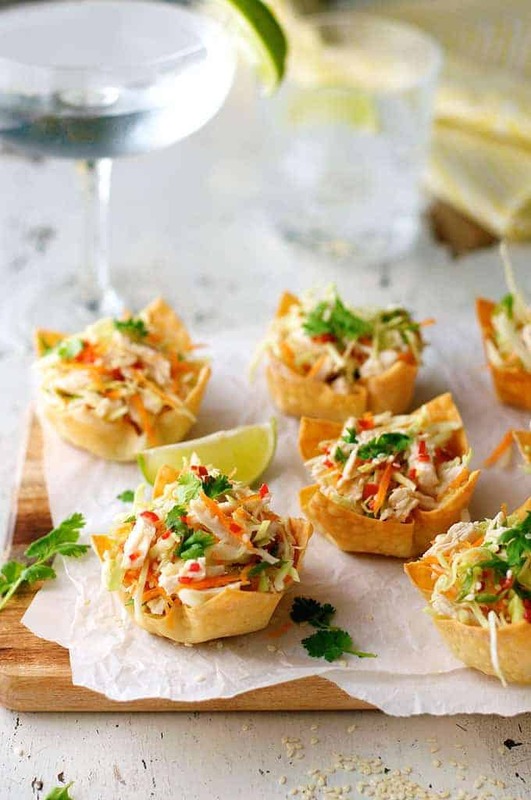 I’d love to include these thai chicken salad wonton cups in an appetizer round up that I’m doing for Parade Magazine this month. Of course Felicia!! 🙂 Thank you for thinking of me!